Panzerwrecks has made a light industry out of publishing photos of wrecked World War Two AFVs, mostly German vehicles from the Eastern Front and post-D Day Europe. 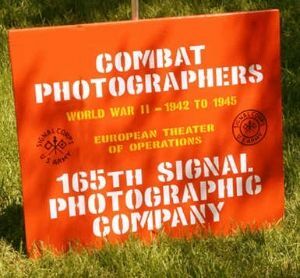 Recently they have branched out with two volumes of photos taken in the European Theater of Operations that were gleaned from the archives of the US Army Signal Corps. Five companies covered the ETO for the Army taking photos used for dissemination to news outlets, for military intelligence purposes, and later on, for unit histories. The men who accomplished this collection of images have been forgotten by history, unlike Robert Capa, Joe Rosenthal and some of the more-famous combat photographers who worked for the wire services and the magazines. 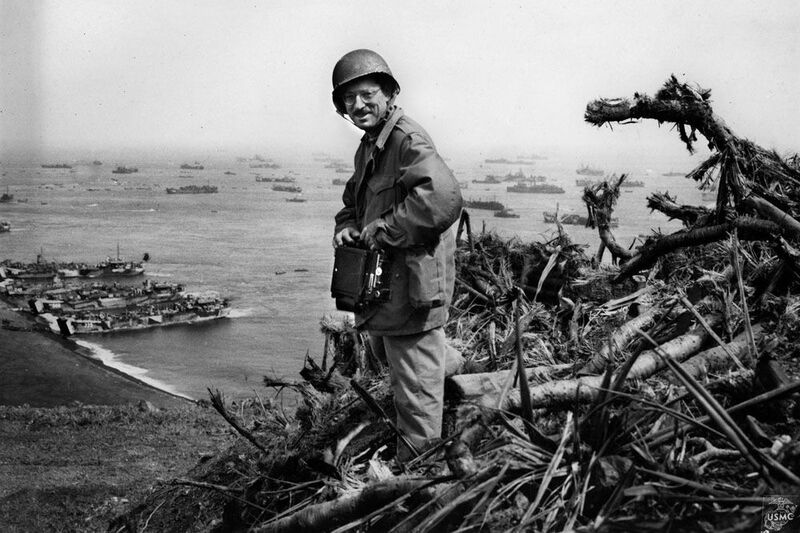 Ironically Rosenthal, whose iconic "Raising the Flag on Iwo Jima" received a Pulitzer Prize and is the most-famous photo to come out of the War, was rejected by the Army because of poor eyesight! Panzerwrecks is attempting to right this oversight by highlighting the work of seven combat photographers. The book includes both their original captions, as well as corrected ones taking into account more-recent scholarship. The book also uses sequences of photos so that the reader can often get a sense of the entire scene, and not just a single view of a vehicle or location. The photos also are of more than just wrecked AFVs, and often include soldiers (GIs and captured German POWs). Additionally, color illustrations by modern artist Filipe Rodna add dimension and texture to some of the vehicles depicted. This book is so good that it induced me to order the first volume (reviewed by Armorama publisher Jim Starkweather here). That's because it goes way beyond photos of wrecked Axis AFVs to include US loses, bored soldiers, life at the front and behind the lines, and in general gives a much richer overview than any couple of ordinary Panzerwrecks volumes. That's not a knock on Panzerwrecks, either, but an indication of just how good the photos are. The quality of the images is razor-sharp for the most part, and the reproduction outstanding. Unlike many photo books, each subject is treated with loving detail, including multiple views in some cases. This allows for a more in-depth appreciation of the subject matter. Many of these combat photographers were on the scene only hours after the vehicles were captured or destroyed, so there isn't the sense of coming on a stripped hulk that is often the feeling with some photographic sources from the period. But the subject is far from just wrecked Axis tanks and softskins. There are plenty of photos of American vehicles, some in fine running order and others who have felt the spear of the Wehrmacht's armor. Those modelers who want a greater appreciation of tanks and trucks in action, at the front, can also see their crews and their uniforms, too. In some cases, like the GIs posed looking down the business end of a Panther barrel, the scenes were clearly staged for the "folks back home." Yet this element of the corny is part of the charm of photos that capture both the awful truth of war and yet exist to generate support for the war among the civilian populace in the States. The photos also have the added advantage of both the contemporary captions and corrected ones added by the editor. Often used as part of the propaganda effort when the photos were distributed to press outlets, the photos with captions generally don't show the awful side of war. The added captions are sometimes on photos that clearly weren't intended for general release, and are aimed at modelers and tank geeks, and feature more in-depth commentary on the unit identities and precise equipment depicted in the images. The longer I model, the more my interest has turned to reference works. Kits are just the notes for creating the music of a story. Tanks are not isolated things, but part of a larger narrative about the period in which they exist (or existed). The more we can encounter them in the field, in action, even destroyed, the better we can understand their use, significance and contribution to history. Thanks to Panzerwrecks for this review copy. Be sure to mention you saw this book reviewed on Armorama when ordering your copy. Highs: A fantastic wealth of photos from a team of US Signal Corps combat photographers. Sharp, clear images, a profusion of subjects, and color drawings to bring life to the vehicles. Verdict: A must-have for anyone interested in post D-Day AFVs and dioramas. Perhaps one of the best general photo reference works I have seen, and well worth the price. That's very cool. The Graflex is the coolest part. Those were THE standard press camera through much of the 60s. Yes. Regarding the timeless Graflex: in the early seventies I worked first for a University Information Office, then for a portrait studio and finally for a Fortune 100 Electrical Manufacture. I shot 35mm most of the time and had a serious 4x5 view camera for the studio work but whenever we went on location and needed the quality of the 4x5 negative I would use the Graflex Press camera. 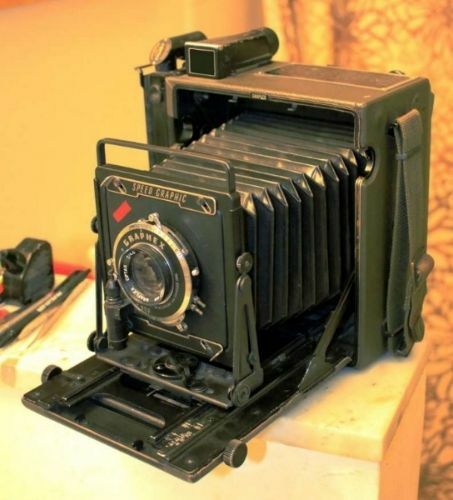 It was lighter and smaller than the view camera but still produced the large, quality 4x5 image negative that was called for. My post-war, ex-US Air Force, KE-12 Speed Graphic 4x5 - Coupled Rangefinder focusing, Grafloc back, Flash Bulb attachment, olive drab body with black bellows and black hardware: . 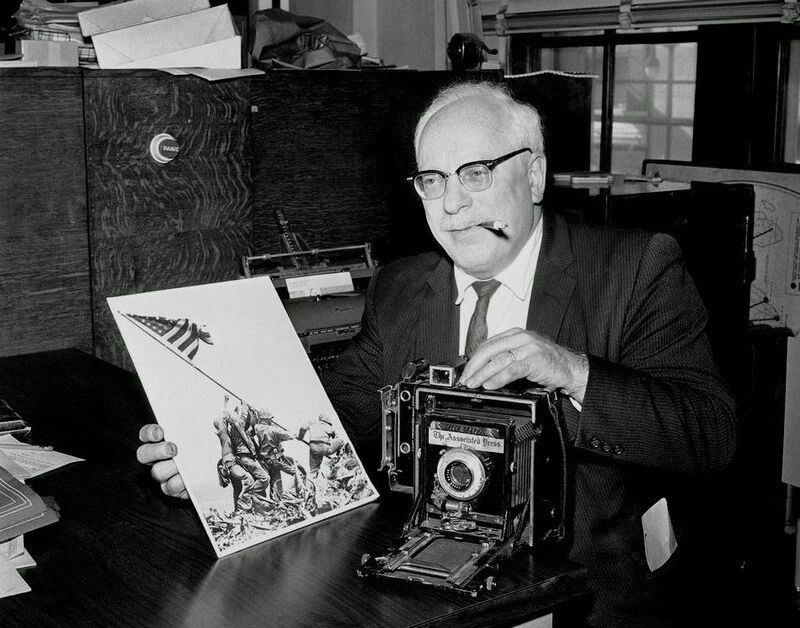 As you can see in the war era portrait of Joe Karr shown several posts above, and the Joe Rosenthal photo below, the 4x5 Graflex was THE still camera most often carried into combat in WWII. The newspapers, Army Publications and magazines required/demanded the high quality only the large negative could deliver! "Forgotten Archives" Vol. 1 & 2 - ORDERED today! Joe Rosenthal on Iwo with "THE" 4x5 Graflex: And again 60+ years later: AP Photographs used here for discussion purposes only. Did not realize Joe used a Graflex. Yes, He fell and smashed one camera on the way up the mountain. He had to run back down to wherever to get a second camera and then hightail it BACK up the mountain to catch the flag raising. Also for the record, the flag raising was NOT a posed picture. Movie film shot at the same time clearly shows this is exactly what happened and Rosenthal did a marvelous job of capturing just the right moment. "Forgotten Archives Vol. 1 & 2 received. -- Highly, highly recommended. The two books combined; a beautiful work, but each book by itself stands as a valuable modeler's and historian's reference! 240 pages of super high quality images, shot on 4x5 negative and printed on heavy grade glossy paper. These books are a wonderful example of the printer's art and offer the best quality reproduction possible. Both volumes are done in a horizontal 8.5" x 11" format with most pages featuring one large photo per page. These pictures show the ultimate realism of the war in Europe, shot by the men who were actually there with the mission to be our witness to history. Dirt, mud and steel are all you are going to see. No pin washes, panel shading or painted ladies here. This is how real armor looked in real combat! Sample Pages of "Forgotten Archives" Volume 2 Hopefully Lee Archer of Panzerwrecks will not object to the reproduction of a few sample pages of their new volume.